I spent the last week in New York, on a much-needed break from Los Angeles in general and Beachwood Canyon in particular. Or so I thought. On Day 1, riding the subway downtown, I found myself sitting next to a young woman having a cell phone conversation about her teaching job in Culver City. Later that same day, I sat in a Chinatown restaurant listening to three twenty-somethings discussing Burning Man and Coachella. It was as if Los Angeles had followed me to New York. But my biggest LA moment was deliberate: having learned of a new Ed Ruscha commission on the High Line, I hoofed it over to West Chelsea for a look. Entering the park at W. 23rd Street, I initially walked by the work because of its size: I didn’t realize it took up the entire side of a building. 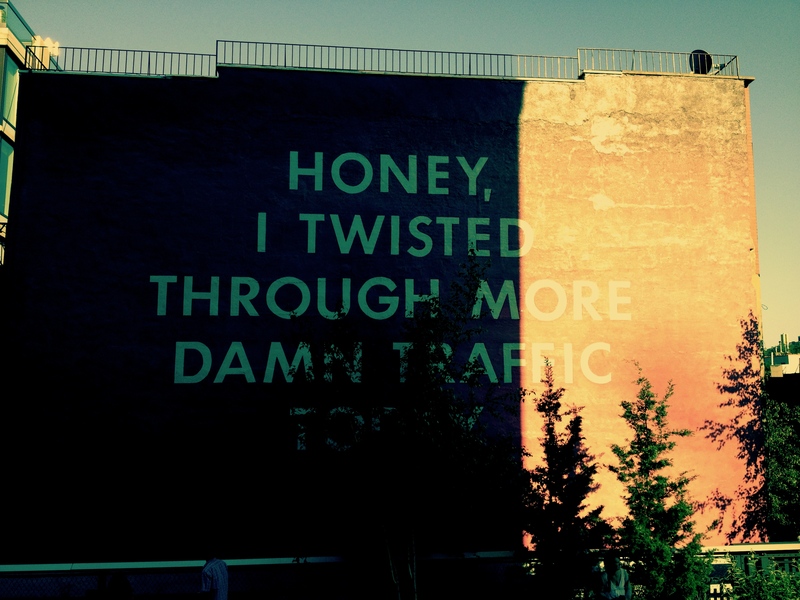 A word painting on a hot pink background, it reads, “Honey, I Twisted Through More Damn Traffic Today”–an LA sentiment if ever there was one. 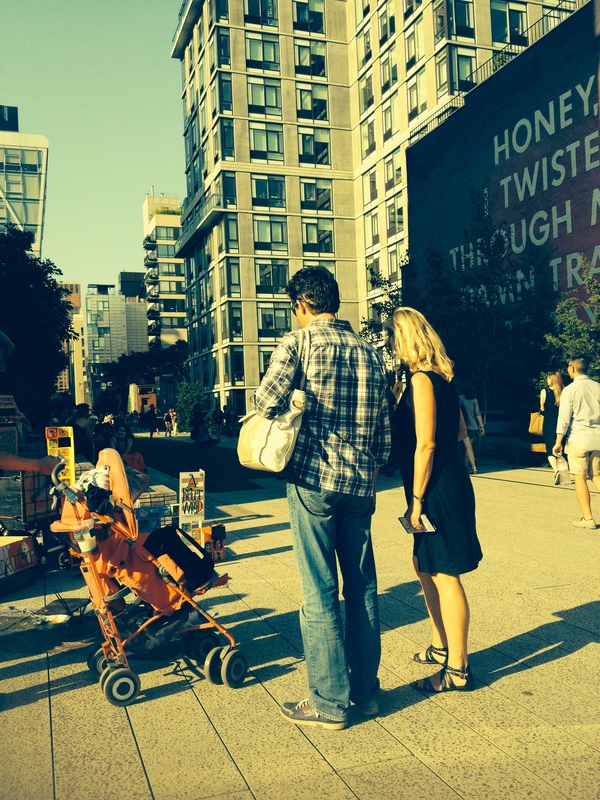 It was appreciated by a crowd of passersby as well as a steady audience on the bleacher-like seating across from it. But instead of attempting a shift in subject matter, as another artist might have, Ruscha continued along his chosen path, creating images of the Hollywood Sign, palm trees and LACMA. (His iconic “The Los Angeles County Museum on Fire” is owned–in a delicious bit of irony–by the Hirshorn Museum in Washington, D.C.) As an artist Ruscha has always been his own man, resolute in his methods and subject matter. But along the way something interesting happened: the New York art world embraced him, and on his terms. His work was prominently displayed in the 2012 Met show “Regarding Warhol: Sixty Artists, Fifty Years,” a blockbuster that probably influenced the High Line commission. Now a blue chip artist with a worldwide following, Ruscha hardly needs my promotion. 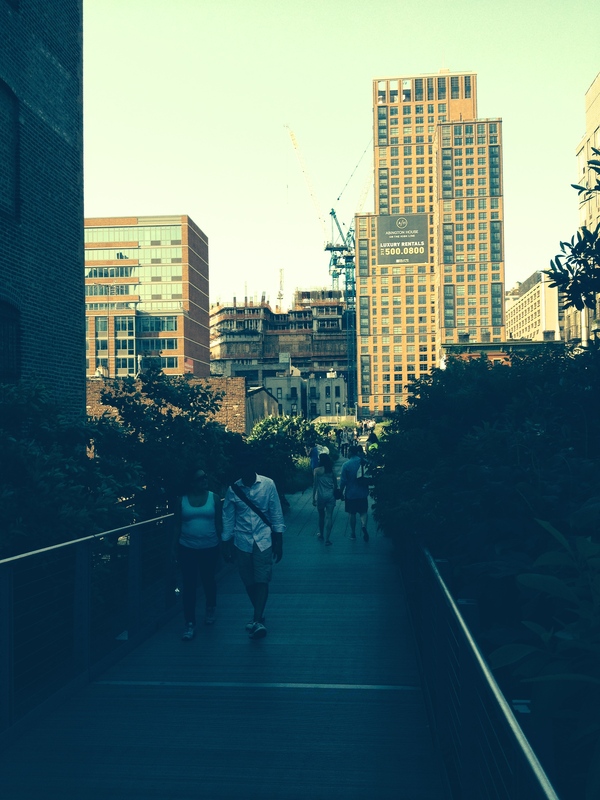 But the High Line painting will be up until May, 2015 and is well worth a visit. As soon as I moved into my house in Hollywoodland in 2005, I started planting fruit trees. Over the years, I’ve planted Meyer lemons, a Bearss lime, a Valencia orange, two peaches (one of which died a sudden fungal death, and a recently planted O’Henry), a Green Gage plum and a Royal Blenheim apricot. 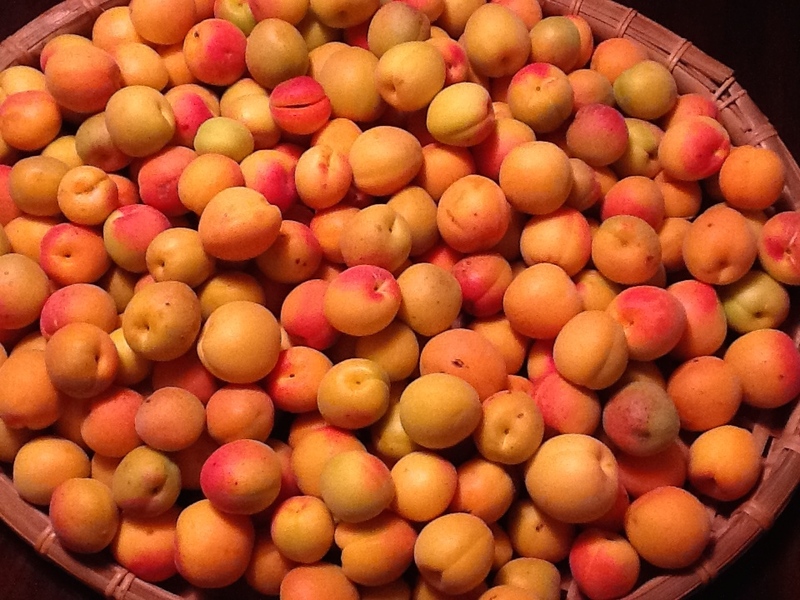 Most of my trees have struggled in the rocky, arid soil, but the apricot–now in its fourth year–has produced superb fruit in exponential quantities. The photo above represents less than a third of the 2014 harvest, all of it picked today. A look at Beachwood Canyon’s history proves my apricot tree is no anomaly. Before 1911, Beachwood Drive ended at what is now Graciosa Street. Beyond the paved road lay orchards that grew apricots. And beyond the apricot orchards was a single ranch, the future Hollywoodland. You are currently viewing the archives for June, 2014 at Under the Hollywood Sign.